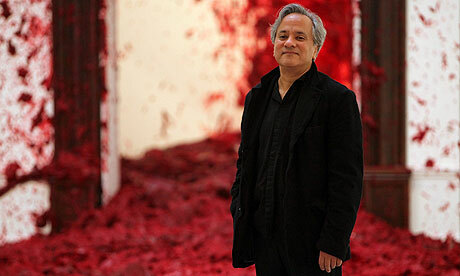 The Turner prize-winning sculptor Anish Kapoor is having his first ever exhibition in his native India. Oh yes this treat to us comes from none other than Louis Vuitton! Anish is a legend. His exhibition last year at the Royal Academy in London was the most successful ever for a living artist, attracting more than 260,000 visitors. Although Kapoor has created gigantic pieces all over the world and site work will begin this week for his Orbit 115m spiral tower at the London 2012 Olympics site, he has only had a temporary installation of one outdoor piece in India. One of the most spectacular pieces from the Royal Academy show, a cannon that fires large blocks of wax into a corner of the gallery, gradually producing a slaughterhouse scene of blood red splodges, is among those being installed in Delhi where the exhibition will open at the end of November. It then opens in Mumbai, Anish Kapoor’s birth place. In Mumbai the exhibition will take over an entire Bollywood film studio, while in Delhi it is at the New Wing of the National Gallery of Modern Arts. But guess what? NGMA has to widen the entrance to bring in Anish Kapoor’s mammoth pieces. Guys this Exhibition is a must-see and is a lifetime opportunity!